There are some toys that are so incredibly special, they can only have come from one place – Santa’s workshop. Here’s our pick of the toys that will have your children believing in the magic of Christmas for many years to come. And the best part for you? No trip to the North Pole required. If it’s a dollhouse you’re after, my number one recommendation is always the super stunning Le Toy Van Cherry Tree Hall Doll House. It’s truly of grand proportions and a showstopper of the toy box, the biggest in the Le Toy Van lineup standing at nearly a metre tall with four storeys (attic included) of living space. Le Toy Van Cherry Tree Doll House is priced $249 at Young Minds Toys. You can find all the matching Le Toy Van furniture and dolls there too. If ever a doll looked like it had dropped in direct from Santa’s workshop, it’s these retro beauties from Lapin and Me. These dolls are faithful reproductions of the original Woodland Japanese squeaky dolls that were so incredibly popular back in the 70s, when I was a little kid (eeeek!). 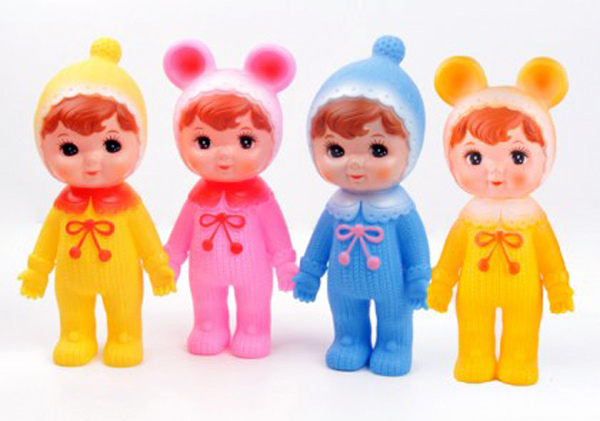 They were recently revived by Lapin and Me and are being made in the very same Japanese factory that turned out the original toys. Made in limited quantities, these dolls are $36.95 each over at From Lola With Love. It’s difficult to improve on the classics, but then Bajo make toys like no other toy company. Take the Bajo snail. Of course, it’s a shape sorter, and a rather good-looking one at that. But it’s more than just a traditional shape sorting toy. Roll the cylinder along the floor on its own to encourage your baby to crawl. Place the shape cylinder back on the snail and it becomes a pull along toy for toddlers. 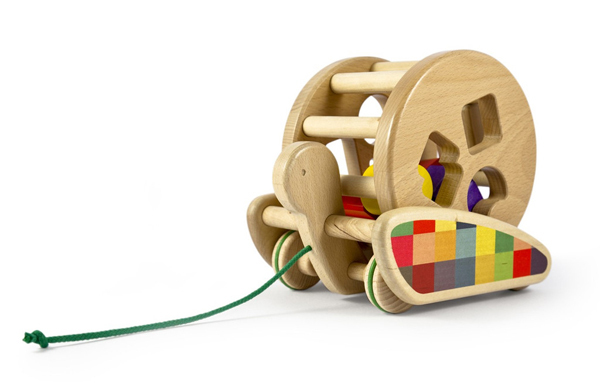 The cylinder spins and the blocks make an enticing clacking sound as they toddle along. With so many ways to play, and so many ways to encourage development, it’s most definitely a toy to treasure. Buy yours from Donner and Blitzen Toys for $83.50. This India Tin Coffee Set by Belgian toy company Egmont is just made for today’s babyccino-sipping tot. Superbly pretty, with its delicate green tinwork and elephant-meets-peacock motif, it includes four cups and saucers, a coffee pot, sugar bowl, milk jug, tray and plates as well as an equally pretty case to store it all in. 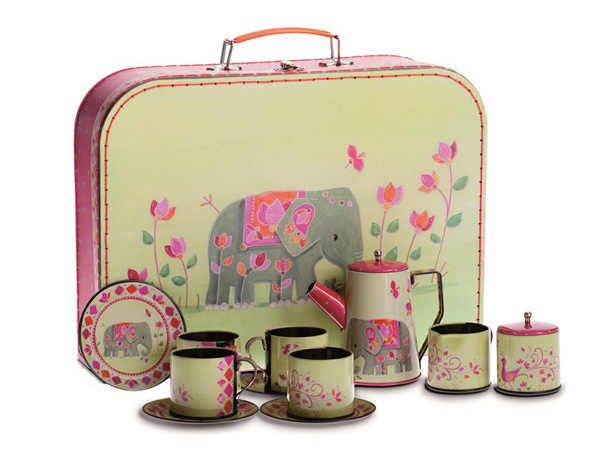 The India Tin Coffee set retails for $59.40 and can be found locally over at Classic Baby, which also stocks Egmont’s darling unisex doctor case with real working stethoscope. A doll’s pram is one of those toys that every child should have and this one from Silver Cross is perfect for children who like pink. A wooden version of the iconic Silver Cross buggy, this is one toy that is sure to get a workout come Christmas morning. It is built to the same exacting standards as you’d expect from this British company, so don’t be surprised if it’s still around for your kid’s kids to play with. The Classic Wooden Dolls Pram from Silver Cross costs $179, with delivery available Australia-wide. Of course, if you have a doll’s pram, you’re going to need a pram-sized doll and we think these German Gotz dolls are another straight-from-the-workshop-of-Santa find. Gotz Maxi Muffin and Muffin dolls (above) are cheek-pinchingly cute and just right for older toddlers and preschoolers. These dolls have huggable bodies for bedtime cuddles and hair that can be washed and dried. We love too that Gotz includes a boy doll in its Muffin range. You can find a wide range of Gotz dolls, including this sweet-faced boy, at Dolls in the Attic or at Little Sprout, where prices start from $65. Older girls might be ready to swap their baby dolls for one that looks more like them. I confidently predict they will fall head-over-heels for Gotz’s Hannah range. The hair on these 50cm dolls can be washed and styled – even curled – and they can be posed in many different ways to suit whichever play scenario your child can conjure up. You can find these at Little Sprout too, or check with Gotz distributor Axis Toys to find a stockist of Gotz Hannah dolls near you. Imagine one of these furry fellows propped up under your Christmas tree for your child to discover on Christmas morning. Special, aren’t they? They’re from Charlie Bears, makers of some of the finest teddy bears in the world and I can tell you they’ll steal a heart or two when it’s time to open presents. You’ll find a mammoth selection of Charlie Bears at Teddy Bear Cottage, with bears for all budgets, from simple first bears for baby to bears that will become treasured family heirlooms. 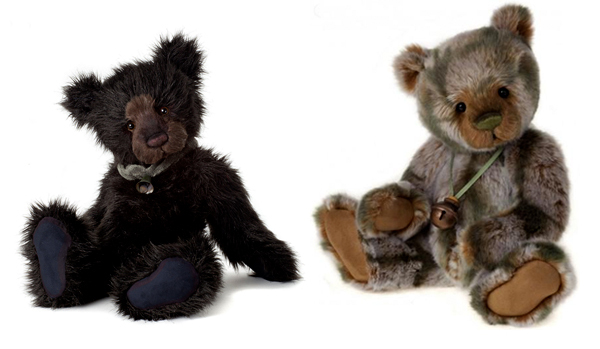 Whichever you choose, know that despite their designer good looks, Charlie Bears are all made for hugs and bedtime cuddles. 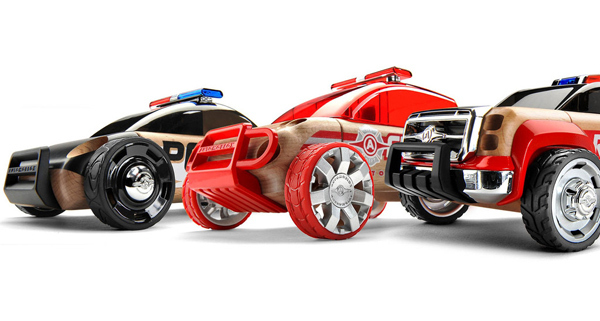 Cars are an easy present choice, but there are toy cars and then there are Automoblox. Trust me, any car-mad kid will go wild for these and you can feel all smug (but in a good way) for choosing a toy that’s as good to look at as it is to play with. The big ones are beaut, but in my mind you can’t go past the smaller sets of Automoblox, which are sized just right to fit a preschooler’s hand. It’s not just the fun of driving – my own kid can spend hours on the floor creating all sorts of wild motoring adventures with his Automoblox minis – but the fact that each can be pulled apart and new hybrid cars created using bits and pieces from different vehicles. Lucas Loves Cars caries a great range of Automoblox, including the new Rescue Mini pack pictured here, which costs $45. 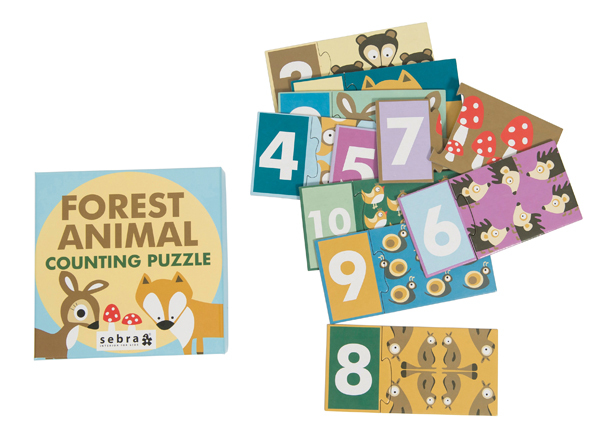 Teach them to count in adorable fashion with this ever-so-sweet Forest Animal Counting Puzzle from Danish design company Sebra. So simple, but so lovely to look at, just as real design should be, there’s something very captivating about this counting puzzle. It’s the perfect simple puzzle for toddlers, with easy-to-slot-together pieces, but it’s educational as well. So that’s a Christmas win-win. The Forest Animal Counting Puzzle retails for $16.95. Contact Design Mode to find a local stockist. The only thing that comes close to the magic of Christmas for children is the magic of fairies, so imagine their delight to have a fairy house right there in the nursery. These sweet houses are made by hand – right down to the painted detail of the toadstool roof – in New Zealand. Made from clay, so they’re a decorative piece rather than a plaything, they come with a little LED light to turn on at night so that visiting fairies know they’re welcome to stop inside and rest their wings a while. 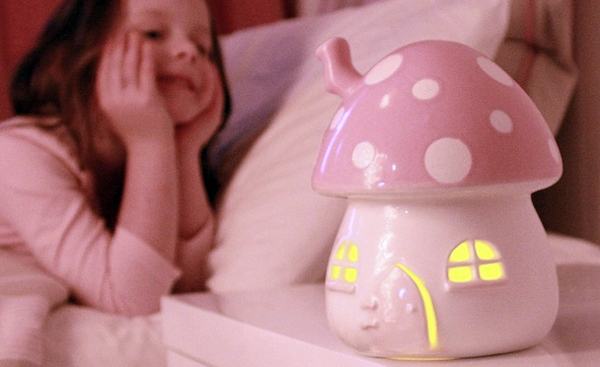 The Magic Fairy House – shown here in pink but available in other colours in time for Christmas – costs NZ$89.95, with free delivery to Australia. Find them at Magic Fairy House. They nest, they stack, they teach. Is there anything these sweet Petit Collage Nesting Blocks can’t do? The garden motif is a unisex winner and certainly lovely enough to display in the nursery when not being used. 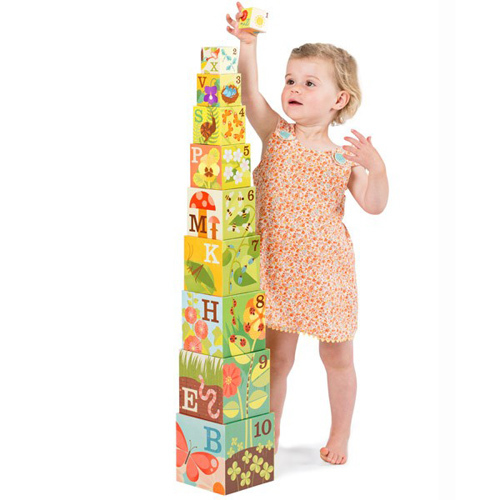 Toddlers will love stacking these blocks into a tower that’s taller than them, plus they’re a great learning tool for introducing numbers and alphabets too. Find the Petit Collage Nesting Blocks at Itty Bitty Greenie, where they cost $29.95. 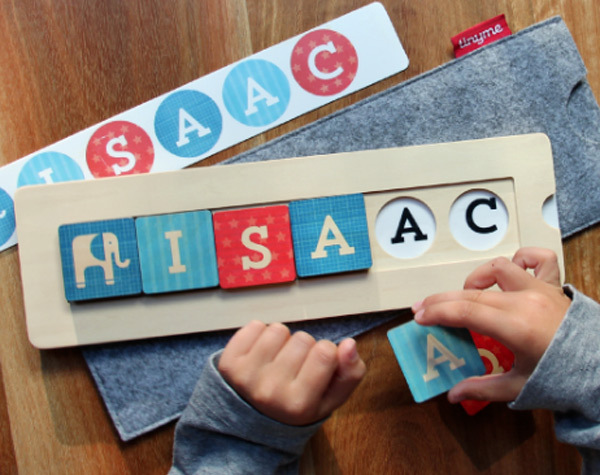 TinyMe make delightful wooden name puzzles that are perfect for older toddlers and preschoolers to help them learn their name. Slide-in cards help smaller children identify the letters, with colour-coded cards for very little ones. They’ll be spelling their name on their own before you know it. Here’s the best bit – everything can be customised, from the fonts to the colours and even the background patterns on the blocks. And it all comes in a special felt pouch for packing away when play is done. TinyMe Name Block Puzzles start at $32 for four-block puzzles. Addditional blocks are $2.50 each, with a maximum nine blocks per puzzle. Sometimes the things we treasure the most are the little things. 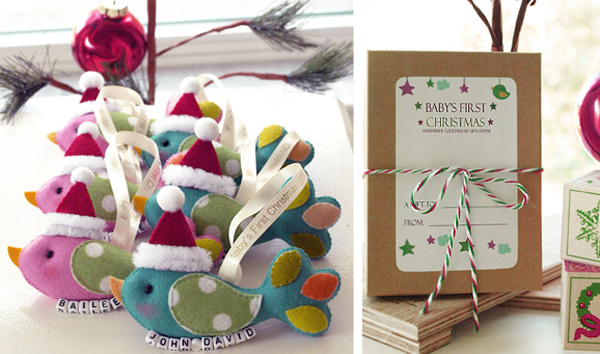 If you’re celebrating the arrival of a new baby this Christmas, or your little cherub is marking their first festive season, then these sweet little Holiday Birds are a very cute keepsake. Handmade from wool felt in candy pink or aqua blue, with a Baby’s First Christmas message on the hanging ribbon, they can be personalised with a beaded baby name and you can chose to add a Santa hat with baby’s birth year embroidered onto it, if you like. You’ll find Holiday Birds over at Gifts Define, where they are priced from US$32, with very reasonable shipping charges to Australia. Trains are another classic toy, but here’s a train set with a quirky twist that’s right up our alley. It’s the Story Express Wild West Train Set from Janod and I can’t think of a little train fan who wouldn’t love finding this one under the tree. Made from wood, it includes blocks to build your own wild western town. Let the great train robbery begin! It costs $110 from Tickle Your Brain Toys.